Are you planning a trip to Lancaster County, Pennsylvania? If so...I am going to share with you my top 3 fun things to see and do in Lancaster, Pennsylvania and all three of these activities are family-friendly and geared towards children. You and your family will have a great time checking out the 3 places on this list. 1. The Lancaster Farm and House is located on 2395 Lincoln Hwy. 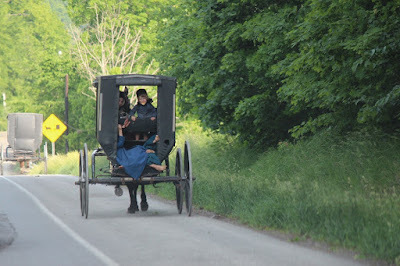 East in Lancaster, PA. and was the first official Amish attraction listed in the U.S.A. The Lancaster Farm and House is situated on 15 acres of Amish farmland. You will visit the farm house which was built in 1805, an authentic Amish one-room school house, beautiful old barns and out-buildings, a covered bridge, visit with farm animals, you can enjoy lunch in the picnic area and visit the blacksmith shop. 2. The Dutch Wonderland Amusement Park is located on 2249 Lincoln Hwy. East in Lancaster, PA. and this amusement park is totally geared towards children. You enter the park through a big white castle and once inside you have access to all of the fun rides and amusements. The castle serves as the entrance point and also houses the park's gift shop. Parking is free and it is handicap accessible. 3. The Hands-on House Children's Museum is a great family-oriented museum and if you have small children...a must see and do activity while visiting Lancaster county. The Museum is located on 721 Landis Valley Road in Lancaster, PA. You can find a complete list of their schedule, exibits and services by visiting their web site online. These 3 family-friendly activities are just the tip of the iceberg that you'll find when visiting Lancaster County in Pennsylvania. There are hundreds more for you and your family to enjoy. Check out the Pennsylvania section here on our travel blog to find more with in-depth reviews on each. Enjoy your trip!